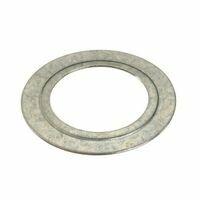 Halex Reducing Washer, 1 X 3/4 in Trade, Steel, Galvanized, 1.11 in ID X 1-3/4 in OD, CSA Certified, UL Listed, 0.0315 in Thickness, For Indoor/Outdoor Applications Indoor or outdoor applications. Use to secure PVC conduit to wood, masonry or similar surface. Bulk packed. To support EMT conduit where greater load bearing is required. Indoor or outdoor applications. High impact thermoplastic. Flame retardant to 105 degrees C. Use with locknut to terminate threaded Rigid or IMC conduit to an outlet box. The rounded surface of the bushing prevents damage to wire insulation. Required by the NEC. UL Listed, CSA Approved. Indoor or outdoor applications. Use to secure PVC conduit to wood, masonry or similar surface. Bulk packed. To support EMT conduit where greater load bearing is required. Indoor or outdoor applications. High impact thermoplastic. Flame retardant to 105 degrees C. Use with locknut to terminate threaded Rigid or IMC conduit to an outlet box. The rounded surface of the bushing prevents damage to wire insulation. Required by the NEC. UL Listed, CSA Approved. Indoor or outdoor applications. Use to secure PVC conduit to wood, masonry or similar surface. Bulk packed. Safe, non-conductive. Schedule 40 non-metallic socket type coupling for joining Schedule 40 non-metallic conduit. Will not rust or corrode. RoHS Compliance, UL Listed. Safe, non-conductive. For adapting schedule 40 non-metallic conduit to boxes, threaded fittings, metallic systems. Male threads on one end, socket end on the other. Will not rust or corrode. UL Listed, RoHS Compliance. Use to reduce the size of the conduit hole knockout opening in a steel outlet box or other metal enclosure. Must use one inside the enclosure opening and one on the outside. UL Listed, CSA Approved. Indoor or outdoor applications. Use to secure PVC conduit to wood, masonry or similar surface. Bulk packed. Use to reduce the size of the conduit hole knockout opening in a steel outlet box or other metal enclosure. Must use one inside the enclosure opening and one on the outside. UL Listed, CSA Approved. Use to reduce the size of the conduit hole knockout opening in a steel outlet box or other metal enclosure. Must use one inside the enclosure opening and one on the outside. UL Listed, CSA Approved. Use to cover exposed knock-out holes in steel outlet boxes and other metal enclosures. Use to cover exposed knock-out holes in steel outlet boxes and other metal enclosures. To support EMT conduit where greater load bearing is required. Indoor or outdoor applications. Indoor or outdoor use. Use to secure Rigid or IMC conduit to wood, masonry or similar surfaces where greater load bearing is required. UL Listed, CSA Approved. High impact thermoplastic. Flame retardant to 105 degrees C. Use with locknut to terminate threaded Rigid or IMC conduit to an outlet box. The rounded surface of the bushing prevents damage to wire insulation. Required by the NEC. UL Listed, CSA Approved. High impact thermoplastic. Flame retardant to 105 degrees C. Use with locknut to terminate threaded Rigid or IMC conduit to an outlet box. The rounded surface of the bushing prevents damage to wire insulation. Required by the NEC. UL Listed, CSA Approved. Safe, non-conductive. Schedule 40 non-metallic socket type coupling for joining Schedule 40 non-metallic conduit. Will not rust or corrode. RoHS Compliance, UL Listed. Safe, non-conductive. For adapting Schedule 40 non-metallic conduit to boxes, threaded fittings, metallic systems. Female threads one end, socket end on the other. Will not rust or corrode. 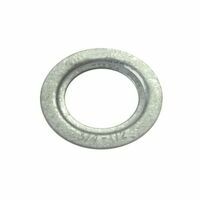 Halex Reducing Washer, 2 X 1-1/4 in Trade, Steel, Galvanized, 1.73 in ID X 3 in OD, CSA Certified, UL Listed, 0.0315 in Thickness, For Indoor/Outdoor Applications Indoor or outdoor applications. Use to secure PVC conduit to wood, masonry or similar surface. Bulk packed. Indoor or outdoor applications. To support EMT conduit. To support EMT conduit where greater load bearing is required. Indoor or outdoor applications. Zinc die cast. In a dry location, use to connect BX cable to a steel outlet box or other metal enclosure. 3/8" size fits 1/2" knock outs. UL Approved. Steel, use to secure BX cable to wood, masonry or similar surface. Safe, non-conductive. Schedule 40 non-metallic socket type coupling for joining Schedule 40 non-metallic conduit. Will not rust or corrode. RoHS Compliance, UL Listed. Safe, non-conductive. For adapting Schedule 40 non-metallic conduit to boxes, threaded fittings, metallic systems. Female threads one end, socket end on the other. Will not rust or corrode.